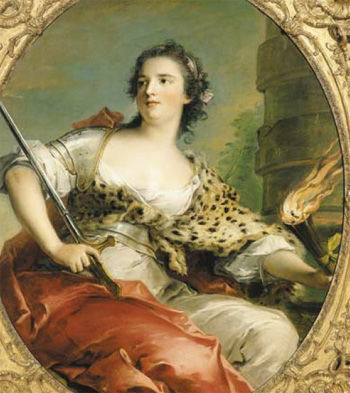 Marie Anne de Mailly, Duchesse de Châteaueoux's reign as Louis XV's mistress appeared to be all but over in 1744 when the king fell dangerously ill at Metz. Since religious rites demanded that the king dismiss his mistress in order to receive absolution for his sins, she was initially sent away. However, to everyone's surprise the king rallied and returned to Paris. What was even more surprising was that he broke the hitherto accepted practice of not returning to a mistress who had been formally dismissed. By November 1744 he was back by her side and Marie Anne received an invitation to return to her former splendid state at Versailles. This sent shivers across the gilded halls of the palace where the triumphant mistress had made her fair share of enemies. Considering that she now stood in the king's good graces again it was not unlikely that she would exact her revenge on those who had worked against her. But then, she herself fell mortally ill. Cramps and convulsions racked her body and she was convinced that she had been poisoned. On 8 December Marie Anne died - just 13 days after returning to Versailles. The question was whether Marie Anne's suspicions were correct - had she been poisoned? The duchesse herself believed that she had been poisoned by her chief enemy, the Marquis de Maurepas. Their enmity went back a long while and upon returning to court Marie Anne had demanded that the king dismissed Maurepas from his duties as minister. However, Louis had refused and instead offered his beloved a chance to gloat over her enemy. The minister was duly summoned and placed before the king and his mistress where he attempted to pass their previous enmity off as misunderstandings. It did not work. Marie Anne continued to insist that Maurepas had poisoned her either at Reims where she had indeed been taken ill and were administered medications or through a letter. It would not have been unprecedented if the king's mistress had been killed. However, one must remember the medical practices of the day. According to the Duc de Richelieu, Marie Anne was bled no less than nine times during her illness. This undoubtedly weakened her body further. Richelieu notes that once she had died it was observed that her "blood vessels were found to be dilated and swollen with blood". To the medical practitioners of the day such symptoms were inconclusive. Thus, they never declared that she had been poisoned - but it was not denied either. One of those who joined the now late mistress in her suspicion was Mouffle d'Angerville who described her death as a "mere act of vengeance". To be sure, Maurepas did have his reasons for wishing to get rid of her. Not only Marie Anne attempted to remove him from his ministerial post but she had also treated him with obvious contempt. One source mentions a time when she dismissed him with a wave of the hand and the words "Off with you". These were hardly an incentive to make friends but insults does not necessarily lead to murder. David Smythe - in his book "Madame de Pompadour: Mistress of France" - bluntly dismisses the claim. His theory is that she suffered from typhus. To be sure, there are some credence to this theory. Marie Anne suffered from several of the symptoms usually associated with typhus including abdominal pain, head aches and fever. More than one source note that she was delirious in some periods which can also be a symptom. Also, epidemic typhus has a tendency to appear rather suddenly. It should also be remembered that Marie Anne had followed the king to the army camp at Metz - such an environment is a perfect breeding ground for disease. However, there is the possibility that Madame de Châteauroux's health was already on the decline. Edmond de Goncourt refers to a situation fifteen days prior to the mistress' death when she was confronted by a friend of hers who warned her about her health. Apparently, there was some concern that she did not sleep nor had any appetite; her eyes were not sparkly and they worried that she might have contracted a sort of fever. Yet, Goncourt also notes that her autopsy revealed nothing but the before-mentioned blood vessels. It is interesting to note that even those of her friends who steadfastly held that she had met with foul play did not press for any action to be taken. Actually, few of the memoirs and correspondence of the time mentions any further considerations on her final illness. Given that she had been delirious - which even her friend Richelieu admits - when she made her claims of poison it is not unlikely that few others actually gave her suspicion credence. The king - at least - did not. There is nothing to suggest that Louis XV believed his mistress to have been poisoned and he had no investigation initiated. Thus, that came to an end and the suspicion remained unproven. Want to experience Versailles on first hand? "Wounded in the King's Service"
The Kingdom is at War!